After many years in the planning and approval process, crews finally broke ground on 15 kilometres of new mountain biking trails in the Creekside Zone of the Whistler Mountain Bike Park. Once complete, the first phase of the Creekside expansion will include five new trails, designed to appeal to a variety of ability levels and riding styles, and will increase the amount of lift accessible riding in the Whistler Mountain Bike Park by 20 per cent. It is anticipated that all five new Creekside trails will be ready to ride for next summer's planned opening of the Creekside Gondola in June 2018. "The new trails in the Creekside Zone are being built to be suitable for both all-mountain and downhill mountain bikes," says Brian Finestone, Whistler Mountain Bike Park manager. "The goal is to create a variety of experiences that will be welcoming for intermediate riders as well as trails that are challenging enough to keep advanced riders coming back for more." The new expansion will be split between three of the world's premier trail building teams. The Whistler Mountain Bike Park Trail Crew will be tackling the main machine-built low intermediate trail as well as teaming up with Gravity Logic on a low footprint machine-built single track. Gravity Logic will build two additional trails including a hand-built single track and another low footprint single track trail accessed from Highway 86. Joyride Bike Parks will be taking the final trail and making it a machine-built intermediate freeride. The purpose of this all-star build team is to ensure the trails are built with individual flavours allowing for the most diversity and a fresh approach. Each will be uniquely built giving riders a new experience on each one. The long-term Master Plan for the Creekside expansion includes 56 kilometres of trails that stretch from the tree line to the valley floor. 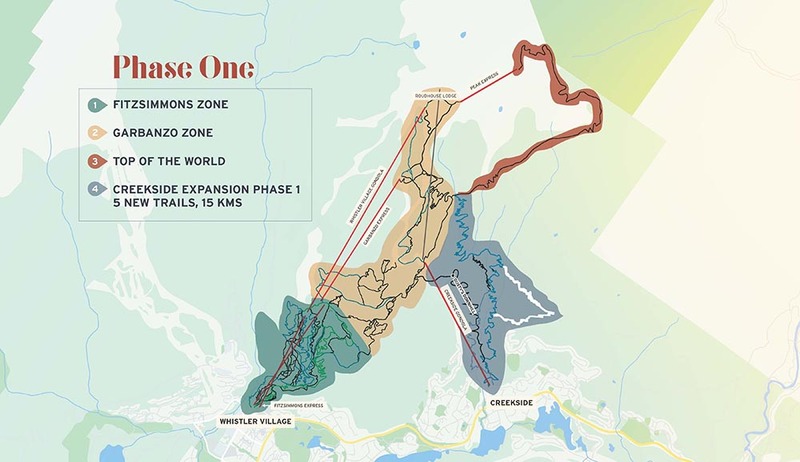 Riders will have multiple options to connect into and out of the existing park and it will be possible to reach the Creekside trail network from the top of the Whistler Village Gondola and the Peak Chair. In anticipation, the Whistler Mountain Bike Park trail crew are developing several new trails within the existing bike park for this purpose. Riders arriving to Whistler this season can currently access the Whistler Mountain Bike Park from the Creekside Gondola and take advantage of free, secure underground parking, delicious BBQ at Dusty's Bar & BBQ, bike repair and shopping at Garbanzo Bike and Bean Creekside, and fewer lift lines. For more advanced riders, the iconic Top of the World trail is set to open July 22nd and will provide an additional access point in to the Creekside Zone. For more information about the Whistler Mountain Bike Park, please visit bike.whistlerblackcomb.com/.